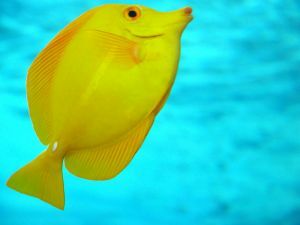 One of the most popular aquarium fish in the world is the yellow tang. It is a type of saltwater fish species that comes from the surgeonfish family. They are commonly found in shallow coral reefs, between 2 to 46 metres deep in the Indian Oceans and Pacific Oceans, ranging from eastern Japan to western Hawaii. Most yellow tangs caught and distributed for aquarium keeping purposes originate from Hawaii, with over 70% of the yellow tangs sourced from this location for the aquarium industry. As its name suggests, this fish is bright daffodil yellow in colour. However, during the night, their yellow colour fades and it turns into a brownish patch with a horizontal white stripe in the middle. When day light comes around again, they rapidly regain their famous bright yellow colour. An adult fish can grow up to 15 cm long and 1 to 2 cm thick in the wild. Adult males are larger than females. They have an arrow-like shape as their ventral and dorsal fins are like an extension of their bodies. Yellow tang also have a long snout-like mouth which is used to eat algae. Near their tail is a sharp spine. In captivity, they grow up to 20 cm long. In order to survive in a tank, it must have a minimum volume capacity of 75 gallons but 100+ gallons in an aquarium is better. They are rather hardy creatures, but they are susceptible to common saltwater diseases such as Ich. They have become a popular fish for aquarium purposes as they are active and are only semi-aggressive with fish of their own size. They are non-aggressive if they are kept with different species. 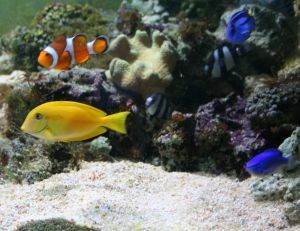 They can be kept with eels, lionfish, large clownfish, cardinalfish, and other Tangs like the Achilles tang or the blue tang. They can also be kept as part of a reef aquarium with other invertebrates. As mentioned above, yellow tang eat algae primarily. However, they also do eat other marine plant material other than benthic turf algae. They also provide a cleaner service to marine turtles as they remove any algal growth from the turtles’ shells. 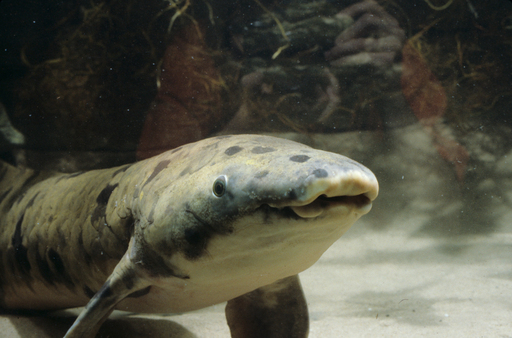 When they are kept in an aquarium, they eat meat or fish-based aquarium food. However, it is thought that the long-term effects of this food is actually rather questionable since they are herbivores in the wild.